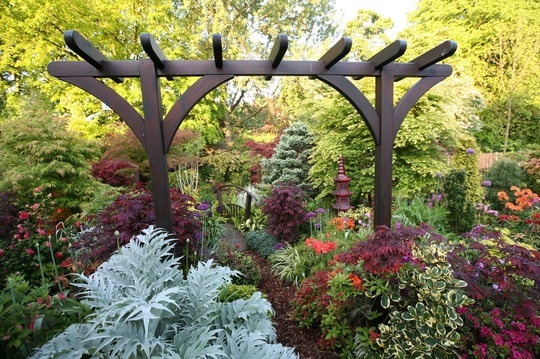 This pergola started life in another part of the garden. Then we built the oriental pagoda and two wooden structures so close together didn't look right. I had been trying to think of some "gateway" for this part of the garden but didn't want trees or conifers - this was perfect. We measured up and dug the holes and carried the archway down the garden and placed it in the holes - it stood up straight and level - as though it had always been there! Thanks - I've just found a book "Succession planting for adventurous gardeners" . It written by Christopher Lloyd, of Great Dixter, and describes exactly what we do - we keep pruning and letting different plants have their moments - the garden is like a giant orchestra! Things are crammed together but we prune very heavily in June, in addition to winter time. Well, this is beyond fantastic!! I want to go there now! Beautiful photography too. Straight into my favourites. It's a Cardoon. It gets 8 foot tall! The silvery foliage is a Cardoon - it has thistle-like purple flowers in late summer, by which time the plant it 8 feet (2.6 m) tall. We cut it down in the winter. In France they cook the stems, which taste a little like celery. Thanks, everyone for your kind comments. Sorry we're a bit quiet at the moment - we're busily preparing for our open day on Sunday 22 February. The snow took two of our weekends - we couldn't garden in that, and we work during the week, so there's a lot of catching up to do! The conifers and shrubs give the garden structure and fortunately, in addition to the primula, the snowdrops and aconites are now in bloom. With no forecast of frost we should be heading for a bit of colour in the garden for next weekend. Thanks, NP. It's our flax that have been got really badly. The dilemma is whether to cut them right down, or try and prop them up - but the leaves look really sad. This photo was taken at Four Seasons .